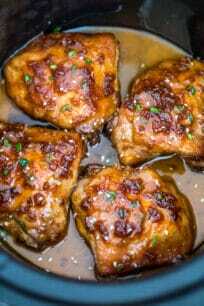 Slow Cooker Brown Sugar Garlic Chicken is the perfect weeknight meal. Simply put the ingredients in the crockpot and you will end up with the best chicken dish ever! In a large crockpot add all the ingredients listed under "Sauce" and mix until fully incorporated. Then add the chicken thighs, and tose them with the mixture to completely coat them on both sides. Ensure the chicken skin is up-sided. Cook on LOW for 7-8 hours or HIGH for 4 hours. To make chicken crispier, broil for a few minutes before serving.